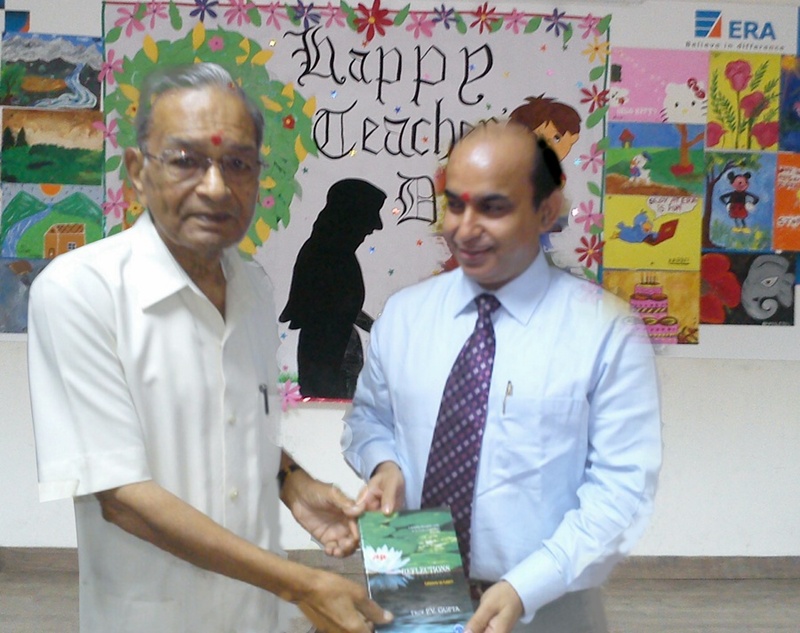 ERA Business School New Delhi celebrated Teachers’ Day at their Dwarka campus recently. The show organized by the students as a mark of respect and affection for their faculty members, turned out to be great feast of music, enthusiasm and sophistication. The Chief Guest of the day, Dr. P. V. Gupta, Retired Director / Principal of Thapar University and a legend in his own right, added a sense of utmost dignity to the proceedings through his graceful presence as also thoughtful words of wisdom. Interestingly, Dr. Gupta has been a student of Sarvepalli Dr. Radhakrishnan in whose honour the tradition of celebrating Teachers’ Day had been initiated some five decades ago. The guests were welcomed with flower petals, tilak and a melody of royal music. Dr. Sanjiv Marwah, Director of ERA Business School, presented the Chief Guest with a memento of remembrance on the occasion. Teachers’ Day is intended to be a special day for the appreciation of teachers, and includes celebrations to honour them for their special contributions in a particular field area, or the community in general. Era Business School, known for its philosophy of making the difference, took up a unique initiative of observing “Teachers week”. As a part of celebrations, day-to-day functioning of the college was handed over to a team of students. The team, comprising of a Scholar Director, Scholar Registrar and two PGDP Coordinators, did take a keen interest in management and running of the institute for full one week. There were some meaningful discussions held wherein they played the role of key contributors to policy development and implementation. As the designated members, the Scholar Director and Scholar Register were responsible for ensuring that student services at the college support the achievement of its vision, mission, values and goals. Expressing the enthusiasm for his new Role, Abhinav Anand, Scholar Registrar, ERA Business School, said that “Teachers put in a great effort to make us feel special in each and every point of life. All of us will be busy some day once we start working with any organization but the lessons which we have learnt from them will remain forever. Hence, celebrating this day to appreciate their contributions is very important”. All the teachers of ERA Business School thanked the students for showing such great enthusiasm and vigor in making this day special by organizing sports matches and cultural evening and wished that they become great future builders of the nation. Dr. Sanjiv Marwah, Director of Era Business School, in his address, thanked the students for their efforts to make all the faculty members special and cared for. He advised the students to benefit through meaningful interactions with teachers and assimilate the noble qualities envisioned by them. He requested the teachers to commit to the noble cause of imparting good education. He also added “The new initiative which we have taken this year will help the students through out their life and the week-long practical experience will help them to perform better as a manager or a person once they start working with any organization”.